When Pilate directly asks him, “So you are a king?” Jesus shoots back, “You say that I am a king…” We are hearing these words from the gospel of John—the gospel where Jesus is seen as the “light that shines in the darkness and the darkness did not overcome it” (John 1:5); as the shepherd who cares for the flock (John 10:10-11); as the path by which we find our way to God (John14:4-6). Jesus, in John, is the bread of life, living water, the lamb of God: he is life. Rarely is he pictured as king. If anything, the word “king” summons up visions of the Roman empire—where it was not about anyone’s way but their way; not about caring and leading and shepherding, but about herding and driving and sending to slaughter; not about light but about crafting the darkness with myriad levels of obfuscation. Jesus wasn’t like that? Why call Jesus king? So maybe “Christ the king” Sunday is a way of reclaiming what power and glory are really about. Maybe “Christ the king” Sunday is the church’s stance of shining a light in the darkness—this is what a king should look like—first a servant to all. Maybe “Christ the king” Sunday is supposed to be ironic, supposed to make us think about what our images of “power and glory” still are, make us reclaim the word “king” for better use. In addition, I was fascinated to discover that Christ the king Sunday is a relatively recent addition to our Christian calendar. Starting in 1925 to be exact, when Pope Pius the XI, decreed a “feast of Christ the King” and other denominations followed suit. And originally (until 1970) it was celebrated on the last Sunday in October—and still is by some communities. And I wondered, what if Christ the king Sunday isn’t about kingship at all? 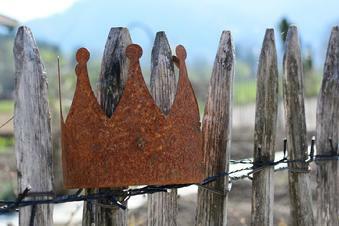 What if Christ the king Sunday is really about us being “made to be a kingdom”? What if “not understanding at all” wasn’t just about power and glory, not just about who truly undergirds the world and eventually dispenses justice, but also about what that means for us? What if we shouldn’t be concerned as much with kings as with kingdoms—and in doing so, what if this day is a reminder, a call, about how we are to live our lives? If we are being “made to be a kingdom” what does that look like? For some, the very word “kingdom” brings up images of hierarchy (and sexism since the powerful king is male) and all the evils these can bring into our world. So some, including many who write the Seasons of the Spirit commentaries, use the word Kindom instead of Kingdom—to lift up the importance of the reworking, the reimaging of connections with others that Jesus was talking about. But it’s hard to escape, particularly in Matthew, Mark, and Luke, the fact that “kingdom of God” is the way they named and thought about a fundamental reality—a world different from the one they were living in. Whatever you call it, this reality is the one we are supposed to live into being. This is what John says believing in Jesus “made us to be.” This kingdom understands power and glory in terms of love and service. This kingdom is not provincial, but extends far and wide, even unto the ends of the earth. This kingdom is constantly inviting in new members; constantly on the lookout for the lost and the least so that they too can come to the table; constantly doing battle with the forces of greed and injustice and violence and death. This kingdom recognizes no ultimate authority but the God of love and peace and justice. This kingdom is our inheritance and our hope. We also know that this kingdom exists only in glimpses and moments, and is something we are urged to work on, each and every day of our lives. Today, as Christ the king Sunday is celebrated in so many churches, people around the world are thinking not only about our king, but “the” kingdom. I like that the World Council of Churches doesn’t ask us all to forget our differences and meld together into one. It asks us to recognize that despite our differences we have a common quest, a common instruction, a common call. And that our most important job is to work with all those who are searching and demanding justice and peace--that we are to be engaged in healing our world. I think we at United have already been trying to walk this way of love. I give thanks for the food ministries that this congregation participates in, coming to recognize the depth and width and length of the effects of poverty on the human body and soul. I give thanks that we are willing to let the Spirit guide us as we walk side by side and hand in hand, 8am and 10:30am people, not trying to be the same, but sure that we have work to do together. I give thanks for all of you who in your quiet and steady ways bring about shimmers of the kingdom: with music that lifts the heart, and in reaching out to those who are lonely or in pain, and in caring about those in need of so much while trying to figure out how best we can help, even in keeping this campus running so we might have a place to be together, and all the other tasks that seem so small but add up to something amazing. When Jesus begins his ministry, he proclaims “The time is fulfilled, and the kingdom of God has come near.” (Mark 1:15). Christ the king Sunday is a reminder that we are to prepare the way, lifting the valleys and lowering the mountains and hills, smoothing out the rough places, and putting down a direct way to see the love and grace of God. We wait for the day when that kingdom is not just near, but has finally arrived. May it be so, Alleluia, Amen.